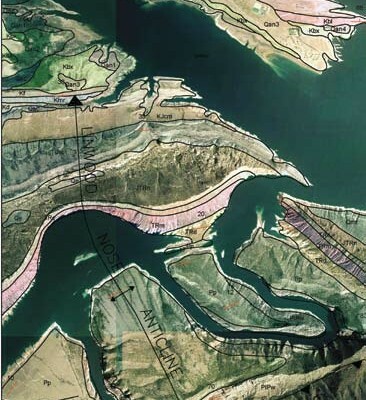 A screen-captured image from the tablet computer showing the geology of part of Flaming Gorge overlain on a color digital orthophoto. 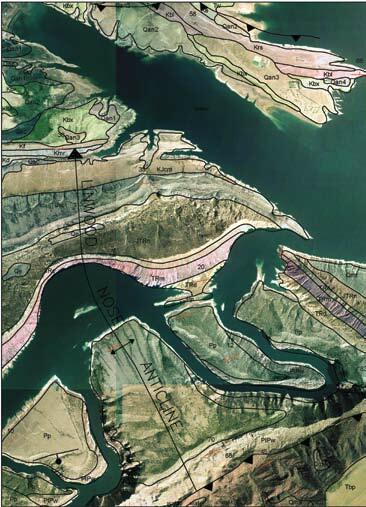 The Utah Geological Survey (UGS) works hard to publish high-quality geologic maps of Utah. We have been successful because of the combined efforts of dedicated geologists and cartographers using cuttingedge technologies. Recently, the availability of rugged, portable computer equipment and specialized software has taken our field acquisition of geologic data into the digital age. Each geologic map that the UGS produces requires fieldwork where geologic information is recorded on aerial photographs, topographic maps, and in notebooks. Through the 1980s, geologic lines were hand-transferred to a polyester film topographic base map, and then the map was finalized using analog cartographic techniques. Since about 1991, however, we have increasingly used digital technologies to transfer field mapping, create an editable geologic map, and prepare final maps for publication (see companion article in this issue). Now, we are beginning to use digital technologies in the field to further streamline map preparation. 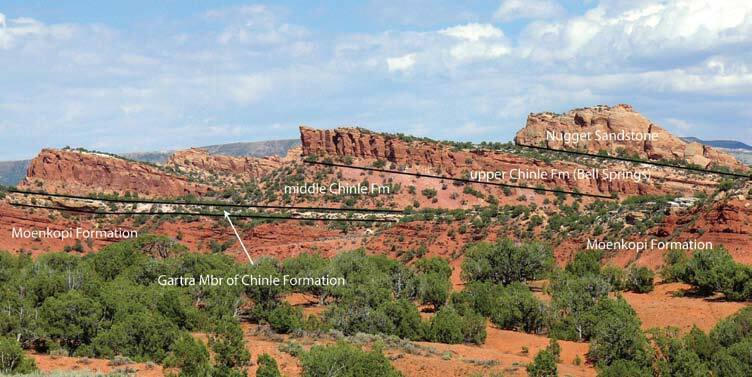 An ongoing project to geologically map several 30′ x 60′ quadrangles (1:100,000 scale) in the Uinta Mountains and Uinta Basin in northeastern Utah illustrates how the mapping process has evolved. In 1999–2001, we mapped the Dutch John quadrangle using traditional methods; these included inking lines and points on “stereo pairs” of aerial photographs (overlapping aerial photos that, when viewed through a stereoscope, produce a three-dimensional image of the terrain). We then hand-transferred the lines and points onto orthophoto quadrangle base maps. The inked orthophotos were then photographically reduced to the same scale as the polyester film base that would be used to produce the final map. The reduced orthophotos were placed under the polyester film base, onto which the geologic lines and points were then traced. Each line and point, therefore, was redrawn three times to get to this stage! Additional inking was needed during review of the geologic map prior to open-file release. The next map in the project, the Vernal quadrangle, was the first quadrangle in which field mapping and later steps were done digitally. 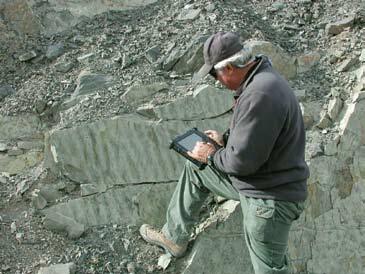 In the field, we used a portable computer called a tablet to record geologic information. Specialized software allows the user to draw lines and points on digital base maps and then transfer the data directly into the office computer used to finalize the map. This eliminates the several steps of hand-transferring and re-inking required by the traditional methods. We are continuing to refine the digital methods during our current mapping of the Seep Ridge quadrangle. For the most part, geologic mapping using digital field techniques is similar to traditional methods. A geologist still goes to the field with a rock hammer, hand lens, pocket transit compass, and stereo pairs of aerial photographs to map formation contacts and faults, measure bedding attitudes (strike and dip), collect samples, and take field notes. However, instead of drawing lines on aerial photographs or topographic base maps, the geologist draws lines on digital images (digital raster graphic [DRG] topographic or digital orthophoto base maps) displayed on the tablet’s screen. The screen is touch-sensitive, allowing the geologist to draw lines using a stylus or digital pen. In addition, geologic features can be added to the map “on the fly” as the geologist walks the contact or fault with an integrated global positioning system (GPS) receiver. Other geologic features such as bedding attitudes and sample locations are also easily and accurately recorded using the GPS receiver and are immediately displayed on the tablet’s screen. Field notes are electronically written into word-processing files using the stylus or portable external keyboard. Finally, digital photography permits the geologist to take a picture of a scene, transfer the image to the tablet computer, and then annotate the photograph in the field. Digital geologic field mapping offers several advantages over traditional methods, but some of the “old” techniques are still needed. For example, the tablet cannot display stereo images, so stereo pairs of aerial photographs and a stereoscope are still needed to see the geology “from the air” in three dimensions. Compared to traditional methods as a whole, however, digital geologic mapping is more accurate, permits the geologist to consistently attribute data in its final form, and reduces errors, all of which save time. 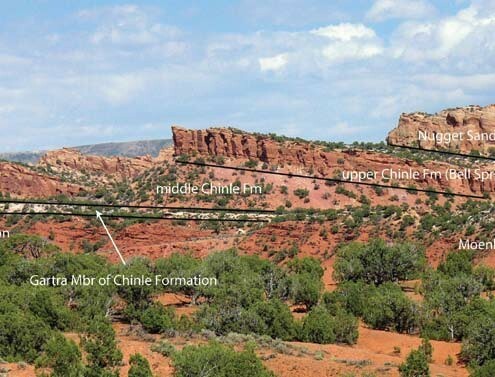 Ultimately, digital mapping techniques help us in our goal to provide accurate geologic maps in a timely manner for effective understanding and stewardship of Utah’s geologic resources. Doug Sprinkel is a Senior Geologist within the UGS Geologic Mapping Program. His principal responsibility is to map the geology of the Uinta Mountains and Uinta Basin. In addition to his mapping efforts in northeastern Utah, Doug has mapped quadrangles in the central Utah thrust belt. Other ongoing projects include a study of Middle Jurassic strata and unconformities and regional correlation of Lower Jurassic rocks. Doug has co-edited two popular books on Utah geology and authored or co-authored 6 geologic maps, 54 professional articles, and 25 abstracts. Kent Brown is a GIS analyst and photogrammetrist with the UGS Geologic Mapping Program and has been instrumental in the development of the program’s geologic map publication methods. He joined the UGS in 1983 and served as Senior Cartographer in the Editorial Program before transferring to the Geologic Mapping Program in 1990 to manage a newly acquired photogrammetry system. Since 2002, up-to-date digital photogrammetry methods have been used and he has developed a system for standardized geologic data creation that is compatible with GIS software.